Preview: UNSETIC Files: Bering Songs and Silence | Doc Says Rawr! I’m thrilled to announce that Bering Songs and Silence is now available at Amazon, Barnes and Noble, and Smashwords as an ebook! I can remember thinking that they probably should have hung a sign on the door that read X-Files in here. As it was, the office behind the steel door at the bottom of the stairs was small, windowless, and spartanly decorated though that didn’t necessarily make it uncomfortable. What made it uncomfortable was knowing that I’d volunteered for this—whatever this turned out to be. Of course, I hadn’t had many alternatives. I sat in the hard wooden chair in front of the desk, staring at the fifty-something man behind it, his hands folded in front of him. He didn’t smile as he stared right back at me. “Oh.” I folded my hands, staring at them. What am I doing here? What am I getting myself into? I must be insane. The door behind me opened. I looked over my shoulder. The man that walked in was slightly older than I was, eyes haunted, face gaunt, a healing cut on his lip and fading bruises on his jaw and neck. I knew him. He was in the Gulf with us. One of the ones we looked for. Merlin. The Gulf had been two years ago this past summer. I’d known one of the two pilots who’d gone down, Mat O’Brien. He’d been my friend. The man next to me, Merlin, had been his. Mat had introduced us at a party back while we were at the Academy. I’d all but forgotten his friend until one hot summer day near the Bosporus. The day two planes from two duty stations went down over the Iraqi desert. We’d searched for the two downed planes for six weeks, found the wreckage of one. That had been Matthias O’Brien’s plane. Not Merlin’s. We never found any sign of Merlin’s. And now here he is, big as life and definitely still breathing. How is that possible? The pilot I barely remembered moved stiffly, sat down slowly in the chair next to me. He didn’t look at me, just stared straight ahead as if I didn’t exist. Stared at the man who was our new boss. Why did I volunteer for this? It was simple, though. I was a part of this because I’d seen someone turn a mortal wound into a minor wound and gone looking for answers. It was all downhill from there. Doubt must have been written all over my face, though, because the man behind the desk pinned me to my chair with his gaze. He’s out of uniform. Part of me was surprised that he was still with the service. He’s been missing for thirty months. Where has he been? How did he survive? How did he disappear? Where did he hide? Blown up? I hope it was doing whatever he did before he got recruited into this spook-factory. I took a deep, silent breath, knowing that neither man would notice it unless they were watching too closely—and neither was. “What’s the assignment, sir?” I asked quietly. I glanced toward Timothy McConaway, studied him for a long moment. There were rumors about what had happened to him in the Gulf, but I’d never believed any of them. From the look of him now, whatever had happened back then hadn’t left him whole. “Don’t make the mistake of assuming that you won’t be, Lieutenant.” Ballard slid the files across the desk. I leaned forward and took one. We’re going to freeze our tails. Does that equate to making a difference? My brow furrowed briefly as McConaway’s words echoed through my brain. All I’d been promised was eventual answers—answers all in due time. No difference-making promises here. Just facts. Just answers to the questions I’d started asking on the flight deck of the Daedalus far too late. The world’s gone crazy and I’m hanging on for the ride. “Yes, sir.” McConaway’s gaze never wavered. He’d taken the folder almost mechanically and had stayed quiet, staring at a spot on the wall somewhere just above Ballard’s shoulder. “You’ll get full briefing on the way out. Everything we’ve got,” Ballard said, mostly to me. It was almost as if McConaway wasn’t there or simply didn’t matter. My stomach twisted slightly. Does that mean he’s expendable? If he’s expendable, what does that make me? I barely suppressed my frown as Ballard kept talking. I stood up, saluted him, and slipped out of that office at the bottom of the stairs. I considered lingering for a moment outside the door so I could maybe catch McConaway on his way out, to talk to him, but something made me think better of it. I left that basement and headed home. Sometimes, looking back now, I think I should have stayed. 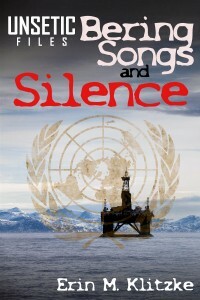 Bering Songs and Silence is available where ebooks are sold. This entry was posted in Books, Modern paranormal, UNSETIC Files, writing and tagged Brigid O'Connell, modern paranormal, new fiction, Paul Ballard, preview, Timothy McConaway, UNSETIC Files, urban fantasy by Erin Klitzke. Bookmark the permalink.